Delving further into quilting I discovered an online service called Compuserve that had a quilting chat group. I was able learn what other quilters were doing. I leapt in and participated in my first block exchange; a 12-inch finished quilt block with a cat in it. In a magazine called Traditional Quiltworks (issue 26) I found a block that was 6 inches finished. The piecing looked easy so I chose to enlarge it. This was my first attempt at redrafting a pattern. After exchanging, I received blocks from California, Missouri, Michigan, Maryland, and Maine. 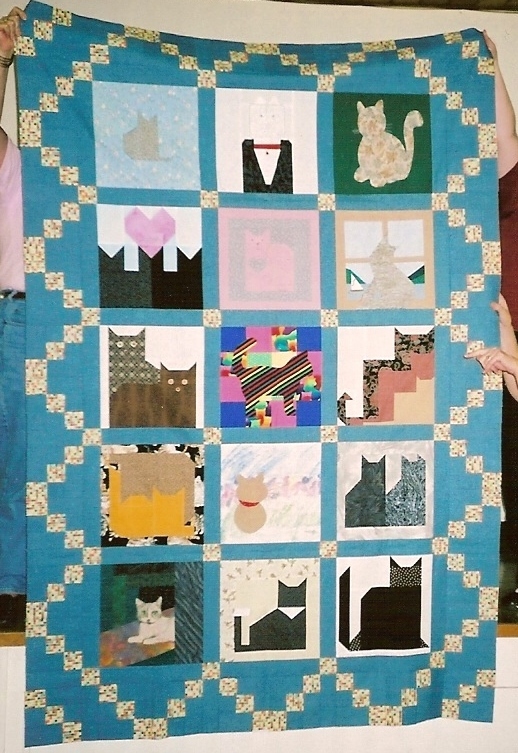 One of the participants sent a picture of her completed quilt to Quiltmaker magazine. As luck would have it, the picture was published. Just imagine... my quilt block and name published in a quilting magazine. How exciting that was! A year later a second Cat block Exchange was hosted. I wanted to add to the blocks I already had in order to make a larger quilt but chose to do a different block this time. It’s the one in the third row on the left and was a pattern from Piecemakers. The block in the lower right corner was the one I had made for the first exchange. Talk about UFOs ... I finally finished this in September 2004. It was hand quilted and given to my stepmother. I love them all! especially your twins. Tammy is a bit jealous.